When I am trying to eat light, the hardest thing to find are meals that carry a lot of flavor, and are fulfilling at the same time. 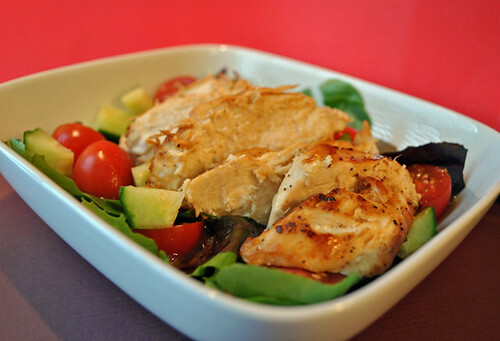 This might just look like boring chicken on salad, but I can guarantee you it packs flavor. 1. In a ziplock bag, add chicken, 1 tsp olive oil, salt and pepper. It is preferable to chill chicken in the marinade for a couple of hours, but its not necessary. 2. In a non-stick skillet, on a medium heat setting, heat 1 tsp olive oil. Grill chicken on both sides until well browned. You will want to flip the breasts when the side being cooked turns golden brown, generally this will take 4-6 minutes, depending on what type of stove you are using. When the time is right, turn the chicken using your tongs and salt and pepper to taste. Cook on this side for another 4 to 6 minutes or until golden brown. You may want to cut the chicken just a bit to make sure it is cooked thoroughly. 3. Remove chicken from heat, and allow to cool. When cool, slice into strips… if you prefer warm chicken on your salad, skip the “cooling” step. It tastes great either or. 4. While the chicken is cooling, prepare your salad and dressing. For the salad, simply combine your tomatoes, lettuce and cucumbers in a large bowl. For the dressing: In a small bowl, or dressing shaker, add olive oil, balsamic vinegar, sugar and lemon juice. Shake, or mix until all ingredients are well combined. Add to salad and toss. *I think this would taste much better grilled, so if you have a George Foreman grill, or Barbeque, use it… if not pan-grilled does the trick. I thought it was a plain chicken until I read the post. Thats a clever (and thrifty) idea to use salad dressing as marinade. I love to use Kroger brand steak (and chicken) marinade. Works in 1 hour and makes great grilled chicken.